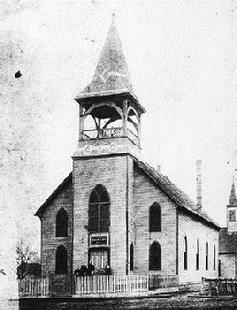 With the support and assistance of the Home Mission’s Board of the German Evangelical Church of North America an effort was made in 1879 to organize a local Evangelical Church in the Billings community. Under the direction of the Rev. W. Hattendorf, St. Peter’s Church was finally and officially organized in early 1880. The founders and the founding pastor immediately made plans--and borrowed the funds necessary--for the erection of a church building. The site for the church generously was provided by the Frisco Railroad for the nominal fee of one dollar. The task of construction was assigned to two other early members: Benedict Hutter and E (or A) Schmidt. The church dedication date was June 20, 1880, and it was upon this same date that the congregation was formally organized and named. St. Peter’s first church structure, built in 1880, served as a house of worship for the fledgling congregation until 1893 when a much larger and more elaborate sanctuary was dedicated. The first church was moved to back of the church lot to accommodate the construction of the new church. Thereafter the original church building served as a church school, Sunday School, and fellowship hall until it was razed in 1967 to make room for the new fellowship hall/Sunday School addition which continues to serve the church today. Soon after the founding of the church the church board decided out of necessity and tradition that there was a need for a church cemetery. The earliest grave marker dates back to 1882, although the church records indicate that the cemetery was established in 1881. St. Peter’ Cemetery remains a cemetery serving primarily the members of the church. Memorial Day Sunday worship is traditionally held at the cemetery. The flag poles are intended to fly the nation’s flag and the traditional Christian flag. The presence of the American flag will in part honor those buried there who were in the military services., which by the way, include veterans of the Civil War, the Indian Wars, as well as the wars and conflicts of the 20th Century. Youth and young people have been central to the life and focus of St. Peter’s Church from its beginning days. There has been an active Sunday School program for all ages here ever since Pastor Balzer introduced the idea in the early 1880’s. An emphasis upon the training of the young has been a priority throughout the congregation’s history and has always been considered essential to the future of the faith and of the church. Throughout the years many dedicated adults have given of their time and talents to the teaching ministry of the church. These teachers have provided both a lasting influence, and endeared themselves to the lives of literally hundreds of children and young people who have been associated with St. Peter’s Church over they years. Eleven years after the founding of St. Peters Evangelical Church, then-Pastor Wenger encouraged the women of the church to formally organize themselves as a service organization within the young congregation. On June 4, 1891, the St Peter’s Ladies Aid was founded, and now for more than 114 years this group has been an essential and exemplary part of the life of the church ever since. Recalling the history and the contributions of St. Peter’s Church over years, within its membership and beyond, could not be told without noting the role of this group throughout the years. For generations now the women of St. Peter’s regularly have met together for study, for prayer and spiritual growth, for fellowship and for service to the church, the community and beyond. Their legacy has included a myriad of special ministries that have touched the lives of countless people, literally all over the world.